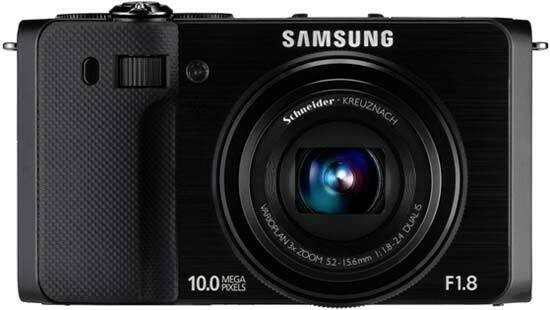 The Samsung EX1 (also known as the Samsung TL500) is a new 10 megapixel compact camera aimed at serious photographers. The pocketable EX1 features a large 1/1.7” CCD sensor, bright f/1.8 lens with a 3x focal range of 24-72mm, and a 3 inch swivelling AMOLED screen. If that doesn't pique your interest, the EX1 also offers an external flash hotshoe, RAW shooting mode, ISO 80-3200, Dual Image Stabilization technology, Smart Range (High Dynamic Range) and full manual control over exposure. The Samsung EX1 / TL500 is available in grey or black for £399 / $449. The Panasonic Lumix DMC-LX3 was first announced just under two years ago and has proven to be a popular model that is still on sale today, defying the 6 month shelf life that most cameras have. With its sensible 10 megapixel sensor, 2.5x, 24-60mm wide-angle lens with maximum f/2.0 aperture, and a wealth of advanced options, it's easy to understand the LX3's success. Now Samsung have seemingly woken up to that fact and released their own LX3-beater - the new EX1 / TL500, which seemingly takes every major specification of the LX3 and improves it. What looks good on paper doesn't always translate into a good product, but it's clear from opening the box and handling the EX1 for the first time that it's a real contender. First impressions are of an amazingly well-constructed, tank-like camera with a high-quality all-metal body that just about squeezes into the compact category. Officially measuring 114.4 x 64.6 x 30 mm and weighing 350g, the EX1 will just fit into a trouser pocket. The depth doesn't take the lens into account though, with the EX1 actually measuring 47mm deep, which means that whilst the EX1 is still pocketable, it's a tighter squeeze than the official figures suggest and better suits a small camera bag. The EX1 is crucially a little bigger and heavier than its main rival, the Panasonic LX3, so choose the latter if size is a major concern. The front of the EX1 is dominated by the 3x lens which provides a focal range of 24-72mm in 35mm terms. The 24mm wide-angle lens makes this one of the more versatile compacts in terms of focal range. If you're used to a "standard" 3x zoom lens which usually starts at around 35mm wide, then you will find that the lens on the EX1 provides an entirely new angle of view that can only increase your creativity. The telephoto end is more limited, though, with the 72mm setting providing an angle of view that's a little narrower than our normal vision (50mm is usually quoted as the equivalent setting). Therefore you'll have to physically move closer to your subject to capture head and shoulder portraits, with more extreme close-ups obviously out of the question. On a more positive note, the maximum aperture at wide-angle is an incredibly bright f/1.8, increasing to a still very respectable f/2.4 at full telephoto. This is a step-up from the f/2.0 lens on the LX3, and much, much better than the lenses on almost every other compact camera. The f/1.8 lens means that the EX1 can be used to shoot at higher shutter speeds or in lower-light conditions and still achieve comparable results to cameras with slower lenses. It also helps to blur the background more and concentrate the focus on the main subject of the photograph. The EX1's lens also has an accessory ring that promises to accept compatible filters and conversion lenses, although none have been announced at the time of writing. Also located on the front of the camera are a sensor for the optional remote control, an AF-assist light/Timer lamp and the first of the EX1's photographer-friendly touches, a dial for changing the shutter speed. Operated with your right forefinger, this dial is perfectly positioned at the top of the textured handgrip and makes it easy to alter the shutter speed when using that priority mode or the fully Manual mode. Moving to the top of the camera, the EX1's built-in flash is particularly neat, popping up out of the top of the body when you open it using the slider switch, and then stored safely away by pushing it back down. 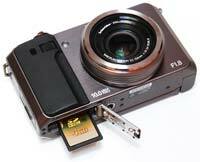 Samsung have also included a flash hotshoe, which as you'd expect accepts an optional flashgun. To the right of the hotshoe are not one but two circular control dials, the first for turning the camera on/off and selecting from the various continuous shooting, bracketing and timer options, and the second for selecting the different exposure modes. The EX1 offers advanced controls over exposure, with full manual, aperture and shutter priority modes on offer, which will appeal to the more experienced photographer looking for a pocket alternative to their DSLR. The icing on the cake is support for the RAW format, which makes the EX1 a real contender in this respect. You can choose to shoot in RAW only, or RAW plus one of the three JPEG quality modes, giving you the best of both worlds. Shutter speeds range from 16-1/1500 seconds, which isn't quite as good as the LX3, and apertures from F1.8 - F6.9. The start-up time from turning the EX1 on to being ready to take a photo is fairly quick at around 2 seconds. Zooming from the widest focal length to the longest is a lot slower though at over 4 seconds - I'm not sure why zooming just 3x takes so long. Focusing is quick in good light and the camera achieves focus most of the time indoors or in low-light situations, helped by the focus-assist lamp. The camera doesn't have any problems locking onto the subject in low-light situations. 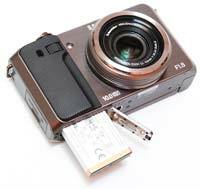 It takes about 1 second to store a JPEG image, allowing you to keep shooting as they are being recorded onto the memory card. Storing a single RAW image takes around 5 seconds, but thankfully it doesn't lock up the camera in any way - you can use the menu system or shoot another image while the first file is being written to memory. The EX1 has a Burst mode which enables you to take 1.5 frames per second for an unlimited number of JPEG images, but sadly there is no burst mode for RAW images so you can't shoot more than a single RAW file at a time. In addition to Program, Aperture Priority, Shutter Priority, and Manual, the EX1 also offers a Dual Image Stabilisation mode which utilises both mechanical and digital techniques (increasing the ISO speed up to ISO800) to ensure that your images remain sharp. Next are an extensive range of scene modes. One of those is Samsung's 'beauty shot' mode, useful for both acne-d adolescents and those of us who have over indulged by automatically retouching out spots and blemishes. Spotlighting the EX1's intended audience as the family, Samsung clearly wants its users to have to spend as little time post-processing images as possible - if any. Samsung's Smart Face Recognition technology automatically adjusts the camera's focus and exposure for up to 20 faces, and it can even recognise the most photographed faces in your photos and focus on them. Smart Face Recognition also lets you quickly search for specific people in your photo album without having to browse through every single photo. The video mode offers 640x480 or 320x240 pixel footage at 30fps or 15fps, but sadly no 720p mode, despite the inclusion of an HDMI port. The final mode on the dial is the clever Smart Auto. As it sounds, this is the manufacturer's equivalent of the intelligent auto modes on competitors from Panasonic (its Lumix range), Sony (the latest T-series Cyber-shots) and Canon (Digital IXUS family). The camera automatically chooses the appropriate settings based on the detected type of scene, detecting 17 different types of scene, so beginners can use this mode and rarely have to choose the right mode themselves. Incidentally, as you turn the shooting dial, a virtual version with the same settings rotates in tandem on screen, highlighting and explaining each one as you select it. Completing the top of the EX1 are holes for the mono speaker and microphone, and a responsive push/pull zoom lever that surrounds a large, tactile shutter button. Once you've zoomed in and got your composition how you want, with a half press of the shutter button the Samsung EX1 is commendably swift to determine focus and exposure, the AF point highlighted in green and an operational 'beep' confirming you're good to go on and take the shot. With very little noticeable shutter lag, at highest resolution setting an image is committed to memory in just under two seconds, the screen blanking out briefly, which isn't bad at all. The rear of the Samsung EX1 is dominated by the three-inch swivelling AMOLED screen, with eight controls located at its right. The AMOLED screen is brighter and sharper than traditional LCD screens, with 920k dot, VGA resolution and 10000:1 contrast ratio. It's also easier to see outdoors, although it doesn't completely solve the issue of viewing in bright sunlight or from extreme angles. It is significantly better than the majority of compact camera screens, and worth paying a premium for. The ability to flip and twist the screen through almost any angle is a great feature that makes it easier to take photos with the camera low to the ground, high above your head or for candid people shots. At the top of the run of controls on the right of the screen is a useful Auto Exposure Lock button and underneath a welcome one-touch movie record button, making it a cinch to start and stop your movie masterpieces. Underneath is the Menu button which provides a range of selectable options, the brevity or otherwise of which is dependant on the particular mode the user is in. Alongside is a button for setting the metering options, with Spot, Multi and Center-weighted on offer. Directly underneath is a four-way directional Navigation pad with an OK button at its centre. This will be familiar to just about anyone who has ever used a digital compact before. Ranged around the four points are options for toggling the Display modes to show a nine zone compositional grid, all shooting information or just the very basics (i.e simply the number of shots remaining), ISO speed, macro and focus modes, and the various flash settings. Surrounding the navigation pad is a slim circular wheel that performs a number of functions, most importantly changing the aperture, and also scrolling through images in and menu options. In conjunction with the Front Dial, this makes it easier to use the EX1 in full Manual mode than almost any other compact that we've reviewed. Below the Navigation pad is a self-explanatory Playback button and the useful Function button, which handily doubles up as a delete button in playback mode. As expected the amount of information and options accessed via a press of 'Fn' varies dependant on which shooting mode is selected. For example in Smart auto mode the user merely has the ability to adjust the image size. Twist the dial around to Program mode however and there's the ability to adjust the image size, set the white balance, swap focus area, choose a photo style and smart filter, turn image stabilisation on or off, and turn the ubiquitous face detection mode on or off. Like its rivals, Samsung also allows user access to blink detection and smile shot in this mode. While that's it for the rear of the Samsung EX1, at its right hand side (if viewing from the rear) we find an included mini-HDMI port for hooking the snapshot up to an HDTV. Increasingly common for DSLRs that also shoot movies, it's still a comparative rarity to find such on a digital compact, although its a puzzling inclusion given the inability to shoot HD video. The required HDMI cable is an optional extra though, so bear in mind if you're on a budget. Alongside the HDMI connection is a proprietary connector for Samsung's power and sync cable - the EX1 is recharged with the battery in-camera, either from an electrical socket or or alternatively straight from a USB port connected to your computer, rather than via an external recharger, which means that annoyingly you can't use the camera with a second battery whilst charging the first. Battery life is good for approximately 250 shots from a full charge, adequate if not incredible. Note that there is no port for USB and AV out. The bottom of the Samsung EX1 houses a centrally located metal tripod mount and a sliding cover for protecting for the shared rechargeable battery / SD/SDHC/SDXC memory card compartment, and there's also 22Mb of internal memory. Also in the box is a quick-start guide as a hard copy, the full manual on CD ROM, plus a wrist strap. Once you have captured a photo, the Samsung EX1 has a good range of options when it comes to playing, reviewing and managing your images. You can instantly scroll through the images that you have taken, view thumbnails (up to 20 onscreen at the same time and in a special Calendar view), zoom in and out up to 11.4x magnification, resize, rotate, change the photo style, apply a smart filter, and adjust apply redeye fix and face retouch, and adjust the brightness, contrast, saturation and even add noise. You can also view slideshows with various effects, delete, protect, add a voice memo, set the print order and copy to a card. The Display button toggles detailed settings information about each picture on and off, such as the ISO rating and aperture / shutter speed, and there is a small histogram available during both shooting and playback.